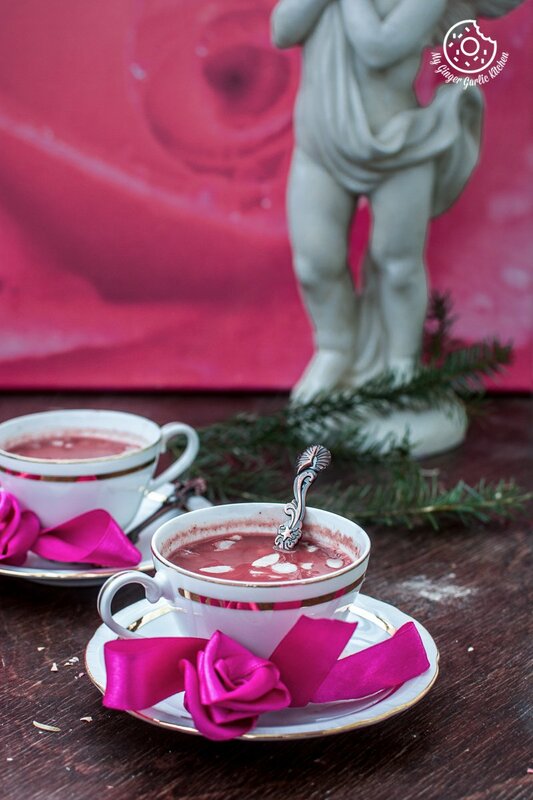 Detailed Kashmiri Pink Chai | Noon Chai with step by step video tutorial. This Kashmiri chai has a rich, thick and creamy, buttery and slightly thick texture which is still thin enough to drink. 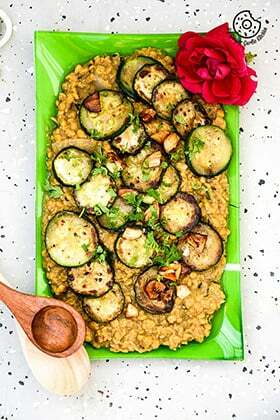 And it comes with a magical aroma of cardamom and saffron and a nutty crunch. 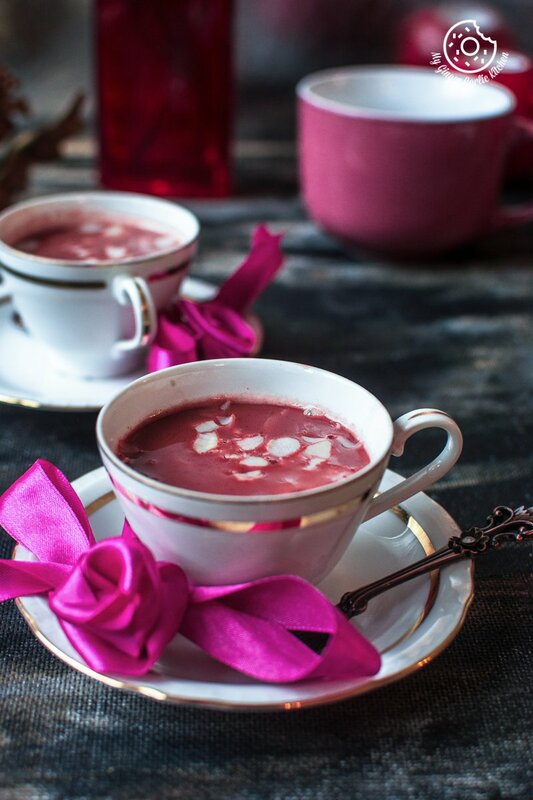 This Kashmiri Pink Chai (tea) recipe has everything you want as bed tea on the morning of Valentine’s day. It almost tastes like a milky dessert to me. 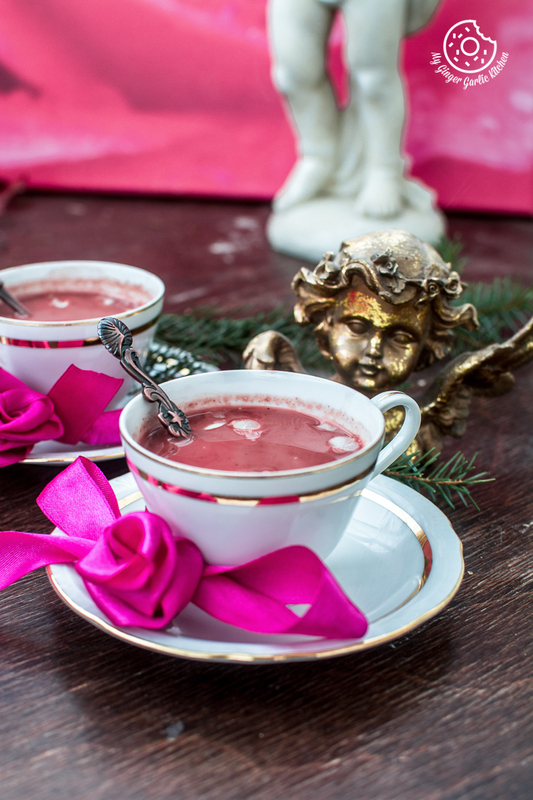 It’s cozy, sweet, thick, creamy, flavorful and deep pink. 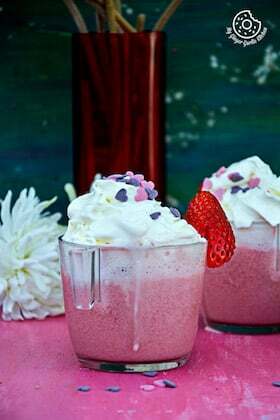 Yeah, pink is a must if you call it a special tea recipe to be used on the Valentine day’s. Right? My mother-in-law has been to northern state of Kashmir a couple of decades ago. She is a tea lover so she never skips the chance to trying a new tea recipe. She often talks about ‘Kashmiri Pink Chai’ and ‘Kashmiri Kahwa’ which she had during her trip to Kashmir. She learned to make kahwa and makes it often during winter. But she never tried making Kashmiri pink chai, because she heard from a native that making this tea perfectly requires a lot of labor and the process is time taking. Seemingly it looked like a tough task, so she never tried that tea at home. I have never been to Kashmir, but I have had this tea during my last visit to India. During our last visit, we went to a traditional cultural fair in our city. There we found a kiosk of this Kashmiri pink chai. Curiously I enquired from my Mom-in-law whether it’s the same Kashmiri tea she talks about. Then we had this steaming cup of pink tea, and soon enough I fell in love with it’s taste and texture. It was very different from the Indian milk tea which we are used to drinking everyday. Everyone in my family liked it. How We Bought Kashmiri Pink Tea Packet And We Got Our Hands On It? Luckily, the Kashmiri man who was selling tea was also selling this authentic Kashmiri chai packets. He said that this tea is similar to green tea, but if you use any other regular green tea, then it wouldn’t give you the same authentic taste. He said we also call this ‘Noon Chai’ or ‘Nun Chai’. When we asked him about the recipe, then he roughly told us how it is prepared. He also said that we should certainly try this at home. It takes time, but it’s worth all the efforts. So we bought a packet of this Kashmiri tea. We tried it according to the seller’s instructions, but something did not come out right. Then I took the advantage of google search and looked for some real authentic pink chai recipes. All of them varied quite a lot, so it was hard to tell which one is authentic. 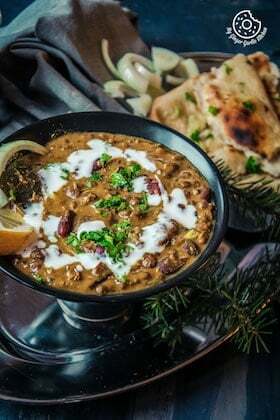 Some people used so many whole spices, other used only cardamom. Some used saffron other didn’t. Some used salt only, some people added only sugar. Some add salt and sugar both. It was very confusing. Shaking tea vigorously all the time. Boiling on medium-low heat for a long time. 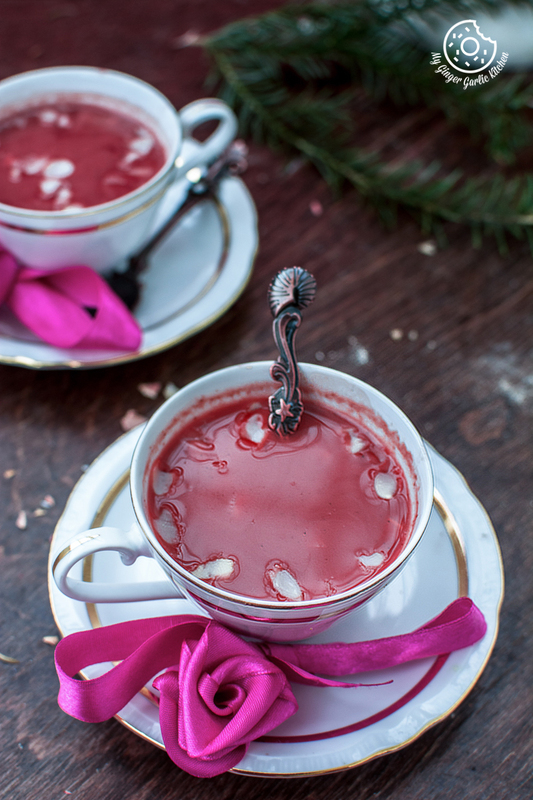 How Is Kashmiri Chai Pink? After finding so many versions, I decided to try a few. So, after a few trials, this is what I found. 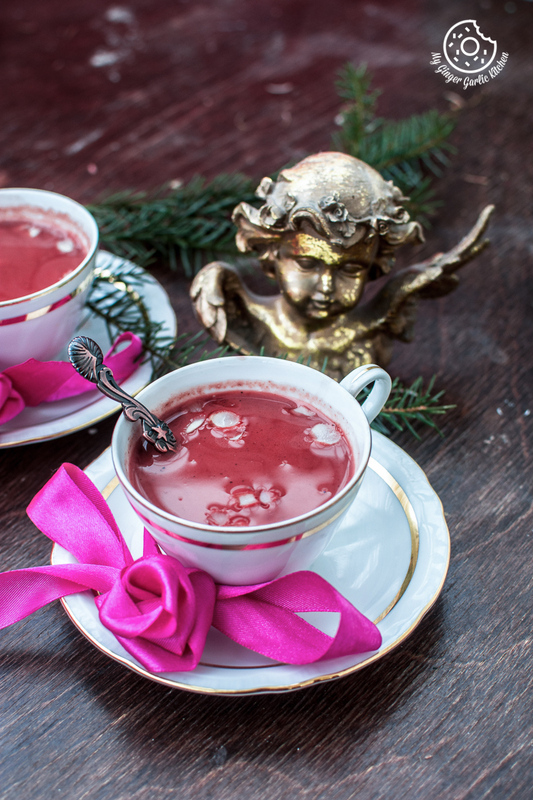 The pink color you get in this tea is due to baking soda. So here is my version which I found so far to be the best one, according to me. If anyone of you know more about this authentic tea, then please let me know. I want to make sure that I am not missing out on something. 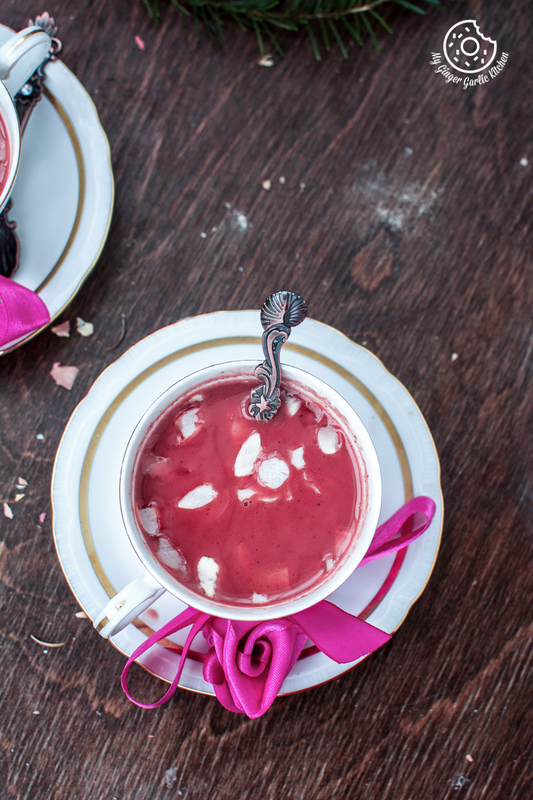 What should be the perfect taste and texture of Kashmiri Pink Chai or Noon Chai? 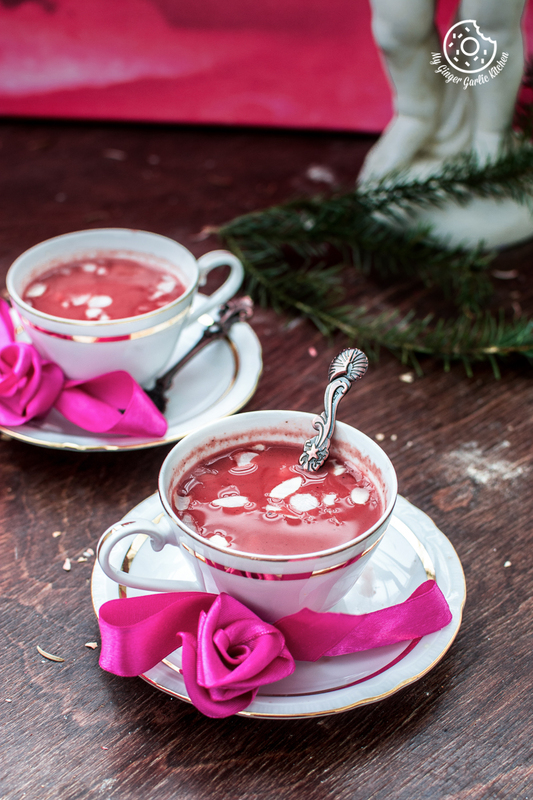 Do you remember the feeling when you drink Spanish hot chocolate? A rich, thick and creamy chocolatey drink which tastes so good. You can expect the same kind of rich, buttery and slightly thick texture which is still thin enough to drink. And it comes with a magical aroma of cardamom and saffron and a nutty crunch. It would give you a long lasting warm sensation. Mmmm, pure bliss during this cold month. No wonder it originated in Kashmir where in some parts the temperature in winters even dips down to minus 30°C. 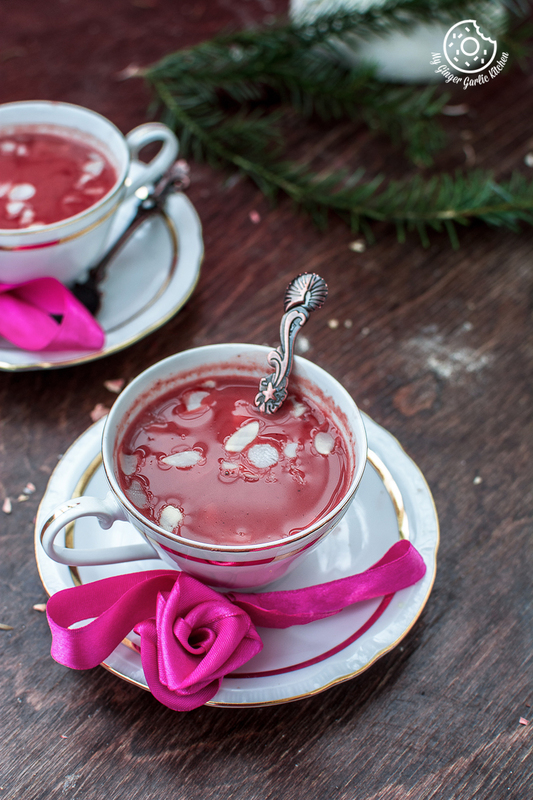 What Makes Kashmiri Chai Pink? There is no artificial color added to this tea. The baking soda does the magic of giving this tea a deep red color. Just keep tossing the tea with a ladle while it gets boiled. You can see the video for reference. A steaming cup of this tea would keep you warm for a few hours. You can pre-boil the tea without milk and keep it in the refrigerator for a couple of days. Add milk, salt, and sugar whenever you want to drink. Give it a good boil for about 10 mins. And your lovely ‘Kashmiri Pink Chai’ is ready. Kashmiri Pink Chai | Noon Chai is a rich, thick and creamy, buttery and slightly thick texture which is still thin enough to drink. And it comes with a magical aroma of cardamom and saffron and a nutty crunch. 1. Pour 2 cups water, green tea leaves, crushed cardamom and baking soda in a pan. 2. Add the tea leaves into the water and steep it well. 3. Let the tea mixture steep well and boil on medium heat until the water is reduced to half. It would take about 18-20 minutes. 4. Keep shaking vigorously with a ladle as shown in the video. 5. Turn off the heat and add 2 cups of cold water. Adding ice-cold water helps in holding the strong pink color. 6. Shake it vigorously again with a ladle for 1 minute. 7. Turn on the heat and let it boil again for 10 minutes on medium heat. 8. Add sugar and salt or only salt or only sugar. Let it boil again. 9. Keep stirring the mixture and add the milk to this steeping tea mixture. 10. Boil for about 10 minutes. The more you boil this tea, the stronger, rich and creamier the tea will be. 11. Strain the tea into cups and add sliced almonds or crushed dry fruits. 12. 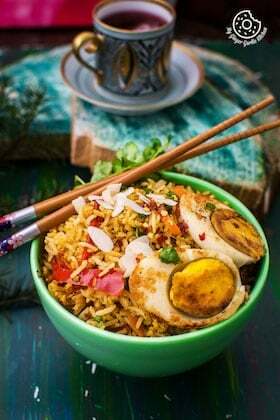 Serve it with your favorite snacks and enjoy. 13. PS: Store this tea in the flask without adding milk and refrigerate for up to 2 days. 14. Add milk and boil it for whenever you want to drink this tea. 15. Adding saffron gives it a nice flavor, so I recommend adding it.